The Unloader® brand name has become synonymous with osteoarthritis bracing and its technology recognized as the industry standard. Its efficacy is demonstrated by more than 15 clinical studies. Reduced pain and increased activity through use of the Unloader One OA knee brace adds up to a better quality of life. With mobility restored, patients engage in various activities without the limitations of a constantly painful knee. Increased mobility also helps avoid weight gain that often exacerbates the symptoms of OA. 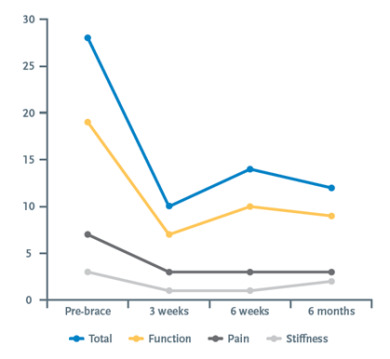 Recent clincial research by the Steadman Philippon Research Institute demonstrated decreased pain, improved function and a reduction in usage of pain medication for patients using the Unloader One brace. The support provided by the brace enables many users to take up activities they might have started to avoid because of the pain and stiffness caused by OA. For some patients, the Unloader One can mean surgery is no longer a necessity, as their mobility is increased and pain is reduced. For others, the brace is used as an interim solution, postponing the need for surgery until they feel prepared for the procedure. As pain decreases, so does reliance on painkillers. While they certainly have their uses, painkillers can have negative side-effects when used over extended periods of time.